Director 7 introduced many new features, and one of the more useful was the RGB color object. It finally allowed Director developers to specify exact colors in their projects. And while it is very useful in that respect, there are two major problems with it. First, it's almost impossible to relate an RGB color to an actual color. For instance, what color is rgb (32,56,117)? Not many people would guess that it's a medium blue. So, while it's very handy to be able to specify exact red, green and blue values, its utility is limited because it's difficult to relate those values to descriptive names, like blood red, olive green or navy blue. The other, more serious, problem is that Director doesn't handle RGB colors in behaviors very well. For example, let's assume you are writing a behavior for a Text member. The behavior will change the color of each line of text as the user rolls over it, and also will change the color of a line to a separate color when the user clicks on it. You want to be able to specify an RGB color for both of these effects in a GPDL dialog. You could always try this by defining a list of colors and then saving them as string properties. Then, in the beginSprite handler for the behavior you could use the value() function to convert the string to a color object. This would certainly work, but it has a few problems. First, the color list is hard-coded, so if you need to be able to specify new colors you will have to edit the behavior. Secondly, the GPDL dialogs are almost unreadable. So, while you can specify a color, the pop-up menus contain text that might as well be in Latin or hexadecimal (which, to a degree, they actually are). The lists that the system needs are initialised by making a call to a handler called buildColorLists. This handler is called in one of two ways. The first way it can be called is directly, in a prepareMovie handler. This code needs to be added to ensure that the data is available at runtime. The second would be in authoring, where you need to ensure that the lists (the color name list and the color property list) exist when you apply a behavior to a sprite. In the GPDL handler there is a call to a method, checkColorLists, that tests to see that both lists have been created; if not, it calls buildColorLists to create them. You aren't limited to the colors that I've included. You can add your own colors to this field (as many as you'd like), but you need to make sure that you call buildColorLists before you try to access them. The buildColorLists handler simply reads through each of these lines and creates a symbol and an RGB color object from the data. The checkColorLists handler just tests to see if either of the two global lists is VOID (i.e. it hasn't been declared); if either is, it calls buildColorLists to create them. 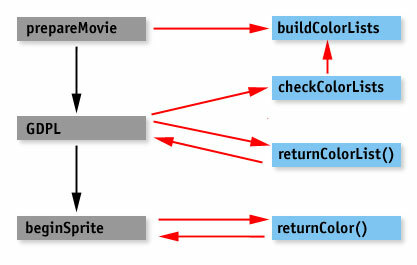 The core of the system is two functions: returnColorList() and returnColor(). The returnColorList() function returns the global list gColorNames. This might seem rather pointless, but its value is that it encapsulates the task of returning the color names so that behaviors aren't relying on direct knowledge of any of the global variables the system requires. This allows you to safely change the names of the global variables, or change the way the data is stored, without ever having to modify your behaviors. Let's use this system in a small behavior. The behavior will use three colors, which are defined in the GPDL: a default color for the text; a color used for a rollover effect; and a final color, used to indicate which line the user has selected. These are all defined in the behavior's getPropertyDescriptionList handler. At this point, the colors are stored as symbols in the behavior's properties. Once the sprite "begins", the behavior will change those symbols into actual RGB color objects by passing the symbol to the returnColor() function. The code has safely converted a symbol into a color object that it can use through the rest of the behavior. Check out the Director 7 sample movie (Mac or PC format) to see the full behavior. This system can also be used in other handlers and objects in your movies. The only concern in using this color system in anything other than a behavior is that you will need to check that a color exists before you try to use it. Since the behaviors are only displaying color names that are in the system, there isn't any need for error checking. This wouldn't be the case if you were just passing a symbol that was hand-coded. The current code will return VOID if the color doesn't actually exist in gColorList. There are some ways that you can expand this system. One example that comes to mind immediately is that the color names could be stored in an external text file that is read in when the movie starts. This would make authoring use problematic, but you could always write code that checks for the existence of an internal Field or Text member and, if it doesn't exist, would read in the color names from an external file. This would make sharing colors among a team of developers very easy. Have fun with the code, and don't forget that there are always methods that you can use to get around some of the inconveniences in Director.